It appears premium subscribers on DStv are gradually leaving the platform. MultiChoice South Africa revealed in June that it had lost many DStv Premium subscribers during the past financial year due to increased competition from Netflix. 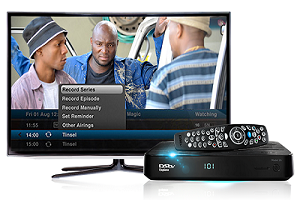 Accroding to why Mybroadband reported, DStv Premium subscribers across the pay-TV operator’s markets in Africa have been declining for the past three years. Naspers’ annual results for the year ended 31 March 2018 showed that DStv lost 41,000 Premium subscribers. 2016/2017, they lost 135,000 DStv Premium subscribers. Between April 2015 – March 2016 they lost 255,000 premium subscribers. However, Its overall subscriber base continues to grow, but most of this growth comes from lower-end subscribers. 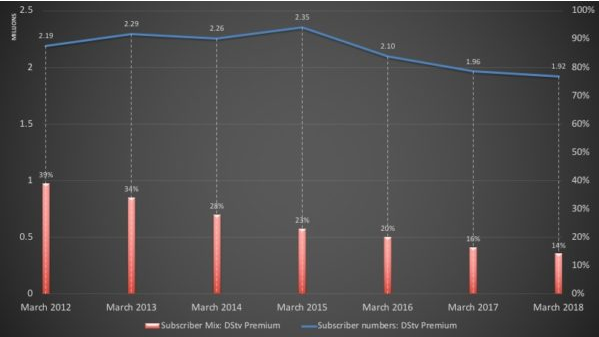 The graph below shows DStv Premium subscriber numbers for the whole MultiChoice Group since 2012. And from 2015, Premium subscribers base began to drop. Beginning from 31st of October 2018, Channel 127 and 128 (Sony Entertainment TV and Sony Max) will be removed, and subscribers are not happy about it. What do you expect when d subscription cost has gone up astronomically. Honestly they know very well that they are responsible for this lost but instead they blame netflix.. They can’t get people back bcos everyone knows what’s up? Increasing subscription prices with reckless abandon… They got what they asked for…. There is netflix and the price hike.. People will go for the most convenient. Most of their programs are repetitive, now we have better options everywhere – Netflix, android tv and many more which offers unlimited channels. 5G is coming next year which is going to make streaming a breeze. They won’t recover from this if they are not going to to act now. They will loose more, wait for honest operators to come on board. So secretive!!!! I saw this coming with too much of repetitive programmes and skyricketting subscriptions.It is good to have known you DSTV. I’m not surprise. Until the reduce ur coat of subscription. Nigeria government is the cause of all this things, they don’t have price control ,honestly if I have opportunity to be ontop government , MTN and DSTV we leave Nigeria as soon as I go in to seat I don’t know what they took Naija for . What’s TStv is doing in hitting the city big since October last year? That’s why good for nothing DStv is exploring Nigerians.